Tout Warriors Archives | TOUT WARS! A scene from the Tout NL 2015 auction. 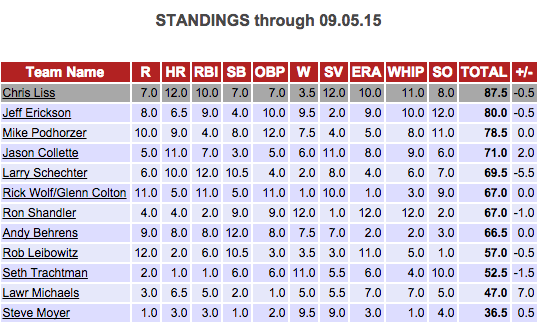 Where will the best and brightest fantasy baseball writers and broadcasters be this weekend? Many will be in New York City, for the annual Tout Wars weekend of drafts and parties. This year’s drafts are being held in the studio at SiriusXM and aren’t open for the public, but you can follow along live on the SiriusXM fantasy sports channel, and on the live blog and spreadsheet at toutwars.com. When are the drafts? Where and when are the parties? Tout H2H: March 18, 7pm. Doors open at 6pm. Ron Shandler is auctioneer. Joe Pisapia has the spreadsheet. Mike Gianella is on chat. Tout AL: March 19, 9am. Doors open at 8am. Brian Feldman is auctioneer. Paul Sporer is on spreadsheet. 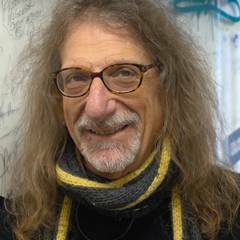 Al Melchior is doing chat. Tout Mix Auction: March 19, 3pm. Doors open at 2pm. Jeff Erickson is auctioneer. Ray Murphy has the spreadsheet. Jason Collette is on chat. Foley’s NY Party: March 19, 8pm. 18 West 33rd Street. Party with the pros! Tout NL Auction: March 20, 10am. Doors open at 9am. Brian Feldman is the auctioneer. Steve Moyer is on spreadsheet. Jason Collette will chat. The live blog for each auction will be available at toutwars.com, where there will also be a link to the live spreadsheet. You can access the live spreadsheet now at https://docs.google.com/spreadsheets/d/12AvDtjmYjr-mlFHXIUkFRDK3EBs_Zy-iJzPZNqRONfQ/edit?usp=sharing. Until the weekend comes, nothing is happening. Author adminPosted on March 16, 2016 March 16, 2016 Categories About Tout Wars, AL, Draft Results, Live Blog, Mixed Auction, Mixed Draft, News, NL, Tout Draft, Tout Mixed, Tout Warriors, Tout Wars Head To Head1 Comment on THIS is Tout Weekend! With a month left in the season we’ve crowned one Tout Wars Champion for 2015: Charlie Wiegert is Tout Wars Daily champion. But what about the other leagues? 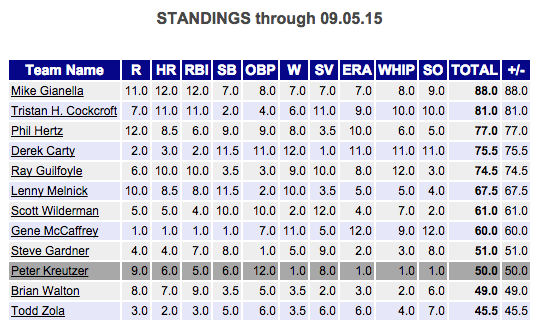 While you can alway check in on the standings and transactions by using the links in the right nav at toutwars.com, at this point it might be a good time to check in on the pennant races. 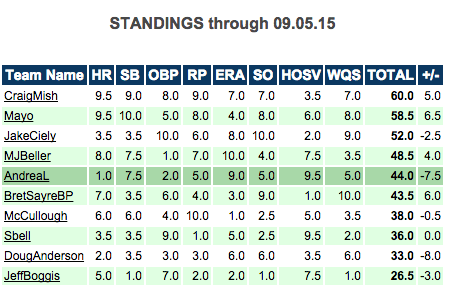 Chris Liss is having a classic Liss season, young pitching, lots of hitting, lots of risk, and is seven points ahead of Jeff Erickson and nine points ahead of Mike Podhorzer. The three have bubbled up and down around the top of the standings all season, but Liss has benefited from Chris Davis’s spectacular season, and Carlos Correa’s emergence after being called up earlier in the year. There are plenty of points in play for all three teams, up and down, for this to turn any which way at any time, but Liss is clearly the fave. Mike Gianella is seven points ahead of standing three-time champ Tristan Cockcroft, but just two weeks ago his edge was only two points. For Cockcroft, the problem has been a freefalling pitching staff, which has won just a single game in the last 13 days, allowing Gianella to pass him. These teams have lots of points in play, too, so while you have to prefer to have the lead, there is no sitting comfortably at this point. Still, Gianella has to appreciate that he was the best team in the first half and has been the best team in the second half. Now he just has to bring it home. 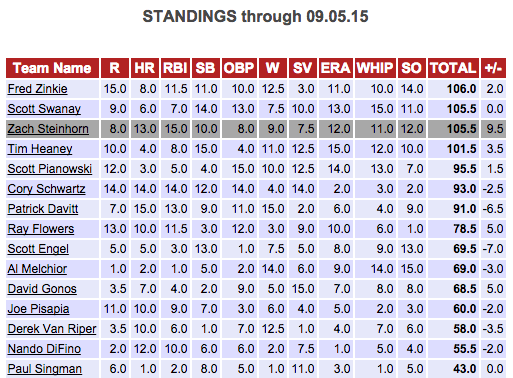 At the halfway mark on the season Zach Steinhorn had a commanding lead, but that was before Fred Zinkie went to work. Zinkie was in 12th place on June 28, 39.5 points behind Steinhorn. From that point to the August 31 trading deadline he made 19 trades, and has taken a slim lead ahead of Scott Swanay and Steinhorn. Swanay was in 10th place on June 28th, and has nearly matched Zinkie in the second half. Meanwhile, Tim Heaney is just five points behind Zinkie, in fourth place. There’s a lot of pennant race to come in this one. 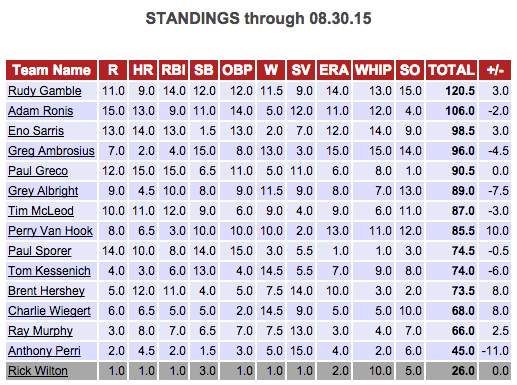 Bret Sayre entered the last four-week contest 14.5 points ahead of Patrick Mayo and 31 points ahead of Doug Anderson. As we approach the halfway point, Sayre is 15 points behind Mayo, who has moved into a tiny lead. What looked like it might be a blowout has ended up a a nail-biter, if you’re Sayre and Mayo. Tout Wars 2015: The Parties! Yes, this year we have two nights of fun to meet the Touts and talk baseball! FRIDAY NIGHT (March 20) Rick Wolf and Glenn Colton, TOUT AL Champs, and the Playwright Celtic Pub (732 8th Avenue–between 45th and 46th Streets) are throwing a shindig on the third floor. Use the password “TOUT” to gain entry between 7pm and midnight. Inside find the Touts, $3 and $4 beer specials, great food and good fun! SATURDAY NIGHT (March 21) is the Tout Wars party. 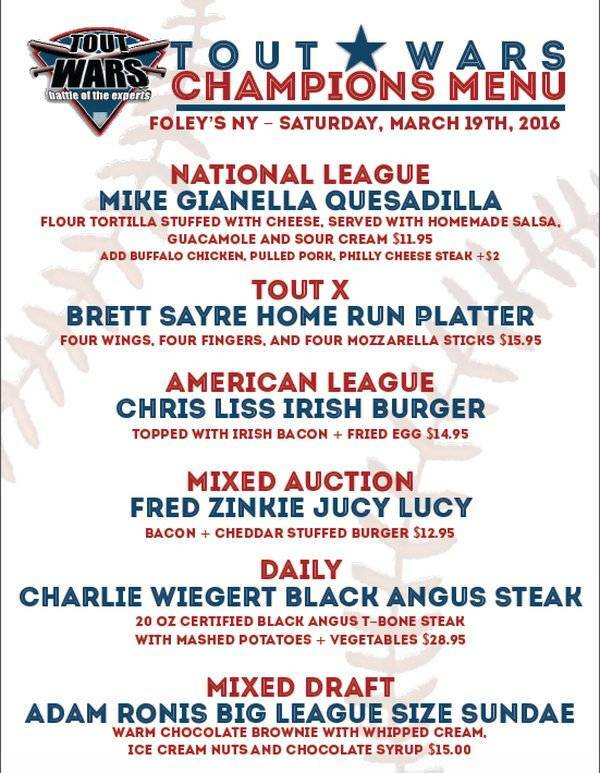 The Touts gather at Foley’s (18 West 33rd Street), a special baseball bar, for food and drink and conversation after a day of auctioning. How do you like their teams? The party starts at 8pm, but the Touts often start to gather earlier. This year Guinness will be at Foley’s for glass etching. As they do each week, mastersball.com has compiled the week’s Tout Wars transactions and added commentary. A pleasant way to keep up with this week’s moves. TOUT Mortems: How Do They Like Their Drafts 2014? The Tout Wars auctions are in the books. The lobby of SiriusXM once again looks like a sophisticated and refined business space, rather than a Phi Epsilon Tout frat basement. (But what happened to the Keith Richards and Paul McCartney autographs on the wall?) All the partygoers made it home from Foleys safely, though there were close calls. And some people are writing about their teams. The spreadsheet with all results is here. The Baseball Prospectus Flags Fly Forever podcast Episode 12 has extended Tout Wars discussionÂ about NL, AL and Mixed Auction, featuring Bret Sayre, Mike Gianella and Mauricio Rubio. 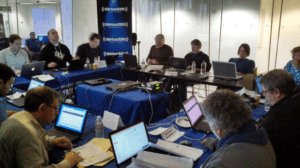 You can hear of more by following #toutwars on Twitter. Tout Wars Mixed Draft Live Chat! You’ll find two different versions of the draft on aÂ spreadsheet here. One is in pick order, the other in team order. Thanks to Ryan Carey for tracking on the spreadsheet. There was a live chat of the event, but a software error seems to have broken that. We’re looking for a way to restore it. Thanks to all the Touts for high spirits and hungry hearts. 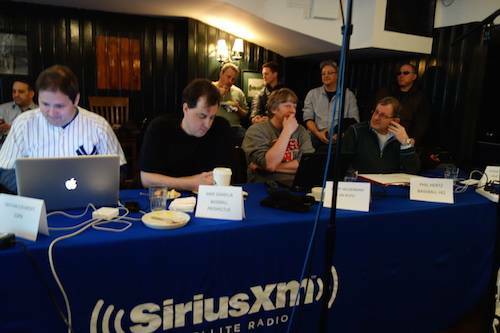 Tout Wars NL Auction will be held on March 22 at 9am in NY, and broadcast on SiriusXM.